Do you love KISS, Thin Lizzy and Scorpions? Do you crave great riffs, mesmerizing twin guitar leads and catchy hooks? Then you need to listen to Danger Avenue! With their new album out later this year, they are here to serve you what’s missing in today’s music climate: classic rock with energy, balls, melody and emotion. Danger Avenue was formed by guitarist and songwriter Thomas Van Shaw and Criss David in Gothenburg, Sweden in 2006. 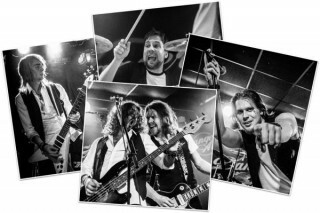 The vision of the band was to play classic melodic rock ‘n’ roll in the vein of Bruce Springsteen, (early) Foreigner, FM, Nightranger, The Who, Boston among others. Today, Danger Avenue are writing the classic rock hits that were never were released in 1978. 2008 saw the release of the band’s first self-titled EP, which sold out a whole six times(!) at Ginza, the largest online music retailer in Scandinavia. The band also received some airplay on national Swedish radio. After fine-tuning their songwriting, Danger Avenue released their debut album “Long Overdue” in 2010. The album got great reviews and was shipped to over 35 countries. The band promoted the album by playing various gigs over Sweden, including opening slots for bands such as Bullet, Evergrey and H.E.A.T. In 2016, Danger Avenue is back stronger than ever! With Thomas Van Shaw on guitars and backing vocals, Rob Jidhed on lead vocals, Viktor O’Malley on bass and backing vocals, Nick Laze on guitars and backing vocals and Criss David on drums, Danger Avenue are here for their second coming. Their new album out later this year embodies everything that’s missing in today’s music climate: classic rock with energy, balls, melody and emotion. The first single Trees is out now!